For years, scientists thought jaguars had been driven out of the Arizona mountains. The animals have faced serious threats from their environment and humans alike. As drought and heat wrought havoc on the land, people moved closer and closer to the jaguars’ expansive ranges, and hunted the big cats for bounty. But now video footage proves that the animals are coming back to the United States—if indeed they ever left. Earlier this month, the Center for Biological Diversity released a video, taken over the summer by a remote-sensor camera, of a wild jaguar roaming the Chiricahua Mountains in Arizona. Nicknamed “Sombra” by local students, he is the third jaguar captured on film in the state since 2015. The camera also filmed bears, a mountain lion, deer, and a coati prowling through the same habitat. The images were captured by a camera trap, kitted out with motion sensors, remote activation, and infrared lighting. Long used by ecologists in the field, traps are going higher-tech, and their images are gaining traction with the broader conservation world. A leopard spotted in China for the first time in six decades. The first wolverine seen in California in a century. The world’s rarest rhino with her calf in Indonesia. A Bornean bay cat; the Saharan cheetah; a giant deer in Southeast Asia—all captured on film for the first time. The list of elusive camera trap subjects goes on. Motion-activated photos and videos provide a very effective way to monitor the extent and effects of changing ecosystems around the world, researchers say. Gathering photographic evidence allows scientists to observe rare and often shy animals in their natural, often difficult-to-reach settings, with little interference, all for the price of a decent camera. 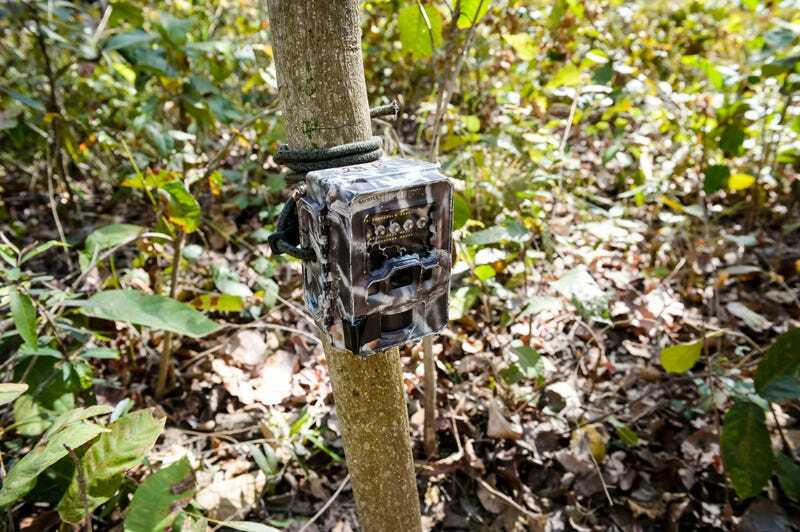 Camera traps have even gone beyond spotting elusive species. Researchers have used the technology to discover new ones, like a giant elephant shrew in Tanzania. Such discoveries move the needle on conservation efforts; after all, you can’t protect something if you don’t know where it is, or that it even exists. “Camera traps are an amazing tool for collecting information on carnivores in all of these ecosystems, ranging from the Arctic to jungles to savannah,” said Lindsey Rich, a postdoctoral scholar at UC Berkeley. Her recent study, published in Global Ecology and Biogeography, surveyed thousands of images from twelve countries and focused particularly on carnivores in remote areas. But camera traps can document any species in any environment—even the mountain lion who couldn’t resist a selfie in front of the Hollywood sign. The images can improve our understanding of animals not just in remote places, but also urban centers—demonstrating where the creatures roam and how they interact with the environment. Researchers then use this raw data to understand how animals migrate, what their breeding patterns are, whether they are healthy or sick, and more. Cameras offer an intimate glimpse into the animals’ lives, often providing new information about how different species interact with their environments and each other. In Arizona, for instance, researchers use cameras to document how animals move around the region and interact with their surroundings, building a powerful case for how to protect them and their habitats. “It’s really important to know where exactly sensitive, rare, or endangered species occur,” said Melanie Culver, a professor at the University of Arizona and a researcher for the U.S. Geological Survey. She works on a camera trap project in the Arizona mountains, but she admits that she doesn’t think jaguars are moving back to the United States. She believes they may have never truly left. Research has also shown that multi-camera setups are more successful in catching a range of the animals’ activity, a finding that Culver’s work supports. Her team first set up six cameras in the Arizona mountains, and, each time a cat was detected, they added another 10 cameras. When El Jefe began roaming the region in 2011, she said, his favorite mountain range was peppered with 50 or 60 cameras. The gear for tracking these animals has, accordingly, gotten fancier, with some researcher-photographers opting for DSLRs over trail cams. The higher-res photos result in sharper, more shareable images—the better with which to pique public interest. The jaguar captured on camera earlier this month ranged across Arizona mountains about 50 miles north of the Mexican border. But the cats don’t confine themselves to one country or another; the males in the U.S. travel to Mexico to breed with the jaguar population of Sonora, and other young males from Sonora may strike out for less-competitive territory. If a border wall were constructed within this range, conservationists argue, the Arizona jaguars would be trapped on one side or the other—left in Mexico to battle other males for territory, or stranded in the U.S. without any females with which to breed. The Center for Biological Diversity, which circulated the video of Sombra last week, also released the popular video of the jaguar nicknamed “El Jefe” in 2016, sparking an international discussion about big cats in the United States. This time, the advocacy organization hopes to harness public enthusiasm for big cats into action. They’re bringing a lawsuit against the Trump administration to halt expansion of the border wall between the U.S. and Mexico that would substantially cut into the jaguars’ range. Melody Schreiber (@m_scribe) is a freelance journalist based in Washington, D.C.